NYSCF CEO Susan L. Solomon penned an editorial in Roll Call commending the approval of mitochondrial replacement therapy, or MRT, by the UK Parliament House of Commons and calling the FDA to action on moving forward with the approval process in the US. 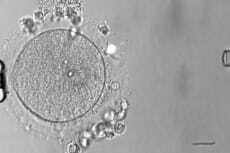 UK Ministers of Parliament in the House of Commons voted 382 to 128 in favor of moving forward with MRT, a technique similar to in-vitro fertilization that prevents the transmission of devastating mitochondrial diseases from mother to child. MRT allows for women with mitochondrial diseases, or with a family history of mitochondrial diseases, to have healthy, genetically related children for the first time. MRT is a technique that was developed in the US and in the UK, including at the NYSCF Research Institute. The UK decision now hinges on approval by the House of Lords. While it’s use is still banned in the US, we hope that this positive decision on MRT in the UK informes the discussion and approval process in the US.